Metro Art Presents: The Floor Improv Day, 2017. Image provided by Farah Sosa. From a diverse range of concerts and multi-cultural dance workshops featuring the best of L.A.’s artists to the summer kick-off of an all-new food film screening series, here’s your guide to the Metro Art events happening in June. All are free and open to the public! Saturday, June 2: Art tour of Hollywood rail stations from 10 a.m. to noon. Meet at the street level entrance to the North Hollywood Station (Red Line). Sunday, June 3: Art Tour of downtown rail stations from 10 a.m. to noon. Meet at the Union Station information kiosk near the Alameda Street entrance. Sunday, June 3: The first in a series of afternoon music and dance improv sessions featuring a music performance by the Red Line Horns brass band, a percussion workshop led by Christian Moraga and dance lessons by Korede “Snoopy” Sonupe (Afro Hip-Hop) and Kati Hernandez (Afro-Cuban) from 2 p.m. to 5 p.m. in the Union Station Ticketing Hall. Saturday, June 9: Art tour of Downtown rail stations (en español) from 10:30 a.m. to 12:30 p.m. Meet at the Union Station information kiosk near the Alameda Street entrance. Sunday, June 10: Art & Architecture Tour of Union Station from 10:30 a.m. to 12:30 p.m. Meet at the Union Station information kiosk near the Alameda Street entrance. Sunday, June 10: The second in a series of afternoon music and dance improv sessions featuring a music performance by an Afro-Caribbean funk band led by Oskar Cartaya, a percussion workshop led by Diego Alvarez and dance lessons by Manuel Gutierrez (Flamenco) and Boogie Frantick (Popping) from 2 p.m. to 5 p.m. in the Union Station Ticketing Hall. Friday, June 15: Metro Art Presents “The Harvey Girls: Opportunity Bound,” (2013, 57 min, Dir. Katrina Parks) as the first installment of our summer food film series, “Fil…mmm at Union Station.” Doors open at 7:30 p.m. in the historic Union Station’s North Patio; screening runs from 8:30 p.m. to 10:00 p.m.
Sunday, June 17: The first in a brand-new series of art tours to Expo Line stations from 10:30 a.m. to 12:30 p.m. Meet at the entrance to Downtown Santa Monica Station. It’s Father’s Day – bring your dad! Tuesday, June 19: We’re taking Metro Art Presents on the road this weekend! Join us at the Promenade Square Park in Long Beach from 10 a.m. to noon for a music performance by Dave Stuckey & The Hot House Gang. RSVP here! Saturday, June 23: The first in a brand-new series of art tours to Gold Line stations from 10:30 a.m. to 12:30 p.m. Meet at the entrance to Del Mar Station. 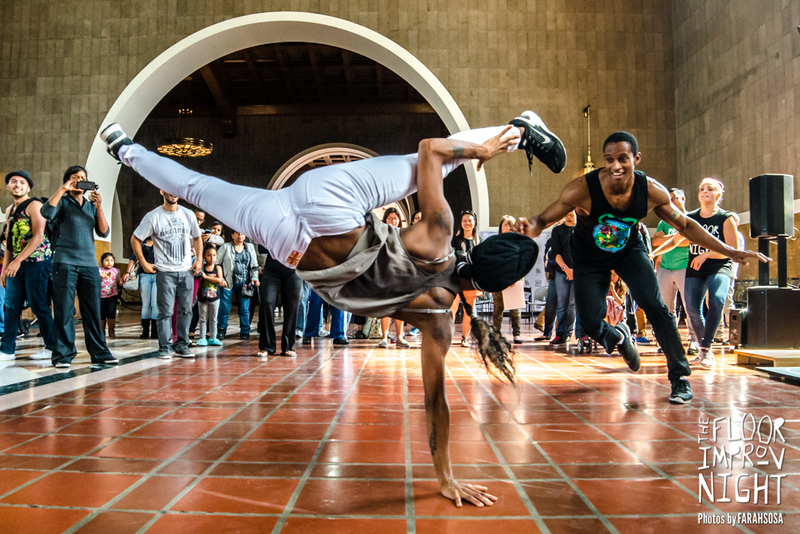 Sunday, June 24: The final installment of afternoon music and dance improv sessions featuring a percussion workshop led by Willie McNeil and Joey De Leon and dance lessons by Gisella Ferreira (Samba) and Carlos Barrionuevo and Mayte Valdes (Tango) from 2 p.m. to 5 p.m. in the Union Station Ticketing Hall. Union Station is accessible via Metro Rail, Metro Bus and several municipal bus lines. Use the Trip Planner for routes and connections. Car and bicycle parking are also available on site. Enter from Vignes or Cesar Chavez. Click here for more information about Metro’s art program, including our popular docent-led art tours and cultural programming. Follow Metro Art on Facebook, Tumblr and Instagram.